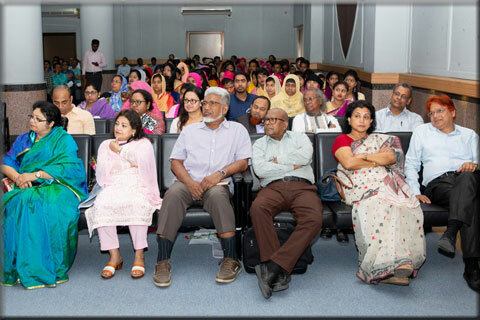 Palli Karma Sahayak Foundation (PKSF), in observance of International Women’s Day, organized a seminar at PKSF auditorium on 24 March 2019. 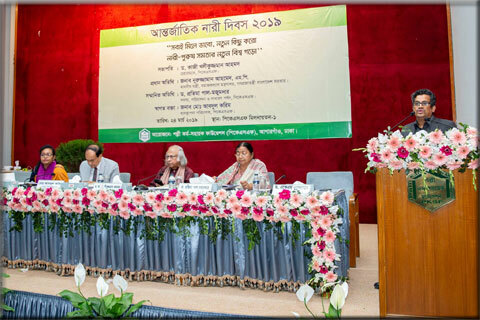 The seminar was presided over by Dr Qazi Kholiquzzaman Ahmad, Chairman, PKSF. 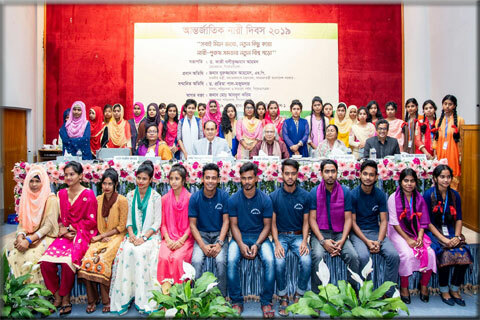 Mr Nuruzzaman Ahmed, the Minister for Social Welfare, was the Chief Guest and PKSF Governing Body Member Dr Pratima Paul-Majumder was the Guest of Honor at the event attended by high officials of PKSF, its Partner Orgnizations and various government offices. 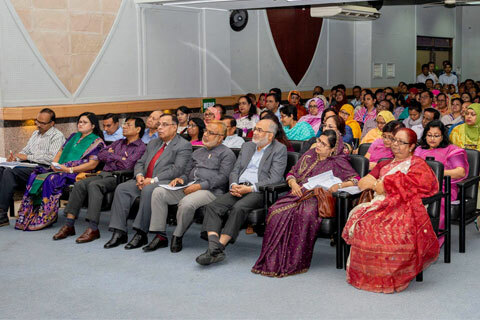 This year’s theme for International Women’s Day “Think Equal, Build Smart, Innovate for Change” puts innovation at the center of efforts to reflect the needs and viewpoints of women and girls and to resolve barriers to public services and opportunities. 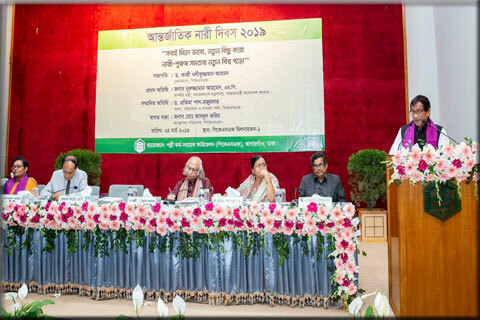 In his welcome address, PKSF Managing Director Mr Md Abdul Karim highlighted various initiatives taken by the Bangladesh government to accelerate the empowerment and progress of the women. He hoped that the Partner Organizations of PKSF will initiate a social movement to change the social viewpoint towards women. 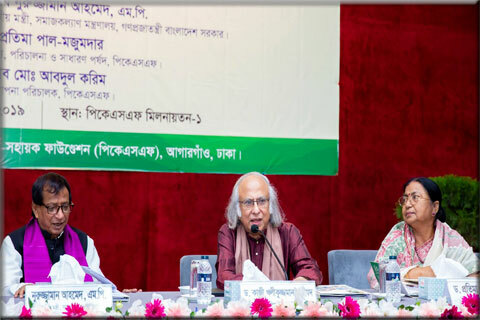 PKSF Chairman Dr Qazi Kholiquzzaman Ahmad stressed on the need for establishing human dignity in society to remove gender inequality. 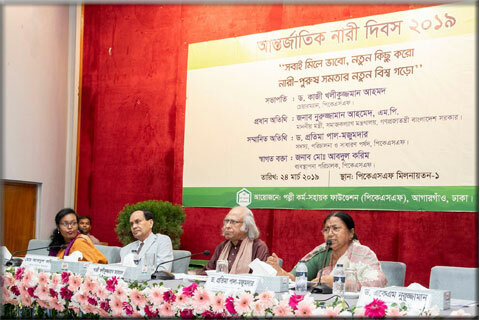 “A mutual co-existence in all spheres of society is the key to establishing a society where human dignity will prevail,” he commented. 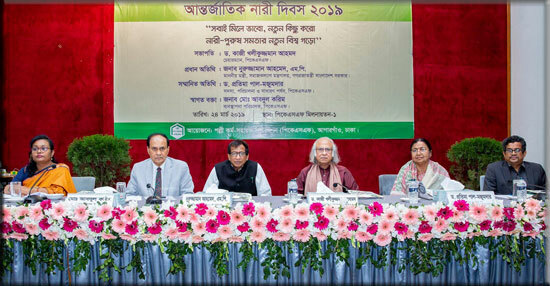 Social Welfare Minister Mr Nuruzzaman Ahmed said, “The country’s development won’t be possible by holding back women from progressing, as they constitute half of the country’s total population.” He highlighted the Government’s women-friendly measures which are “effectively reducing” the gender disparity and ensuring advancement of the women. 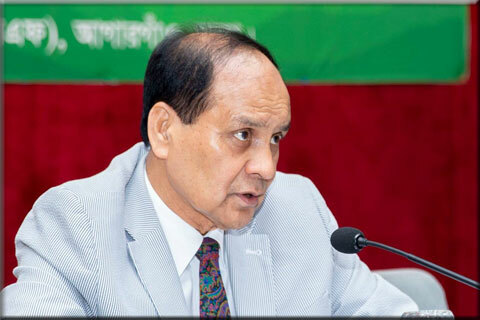 He further stressed on the need for work unitedly to build a pro-women society. 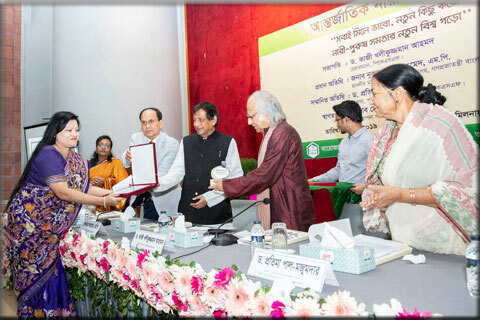 On the occasion, PKSF Honored Ms Nasima Begum, Executive Director of Shishu Niloy Foundation, for her special contribution to women empowerment and socio-economic development at the grassroots. Besides, PKSF General Manager (Program) Dr AKM Nuruzzaman presented the key notepaper titled ‘Accelerating Women Empowerment & Gender Integration through Access to Basic Services, Public Resources and Work Opportunities: PKSF Experience’. 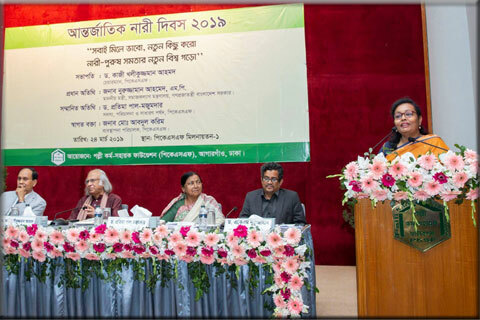 Dr Sanzida Akhter, Associate Professor and Chair of the Department of Women and Gender Studies, Dhaka University, discussed on the keynote paper.